Florida’s newest craft brewery opens its doors Dec. 30. The opening of Saltwater Brewery, in Delray Beach, a seaside city midway between Fort Lauderdale and Palm Beach on South Florida’s Atlantic Coast, culminates more than 20 months of planning, construction and, of course, some frustration. Founded by a group of local beer aficionados with the help of a veteran brewer, Saltwater Brewery opens with seven beers flowing from its taps, ranging from an easy-drinking pale ale to a deceptively easy-to-drink Belgian strong ale that clocks in at 10 percent ABV. Located at 1701 W. Atlantic Ave., Delray Beach’s main thoroughfare, Saltwater Brewery is housed in a converted 1952-era barn/former antique furniture store adjacent to the CSX railroad tracks that parallel Interstate 95. A frequent visitor to Florida, I happened to be in Delray Beach just prior to the brewery’s opening and used the opportunity to meet its founders and sample some of the brews. The beers are well crafted, clean, flavorful, well balanced, and each distinct from the other. 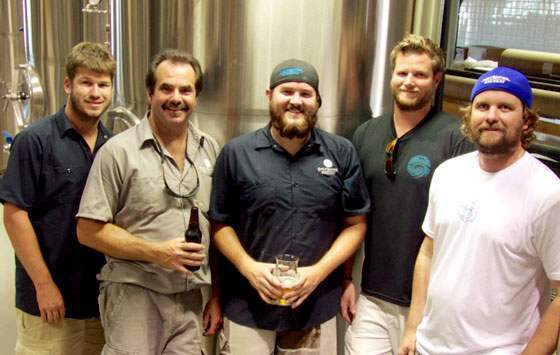 Saltwater Brewery founders Chris Gove, brewmaster Bill Taylor, Dustin Jeffers, Bo Eaton and Peter Agardy. 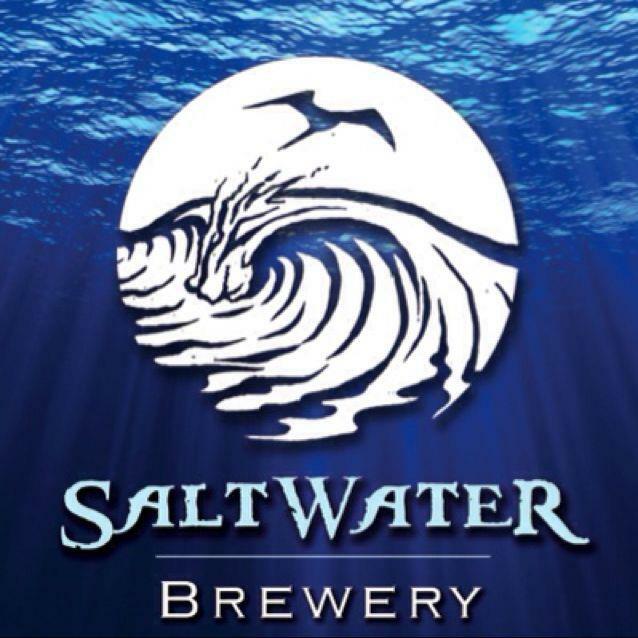 Saltwater, I was told, had its genesis in April 2012, when a group of local beer lovers– founders Bo Eaton, Peter Agardy, Chris Gove and Dustin Jeffers – came together and decided to open a brewery. Brewmaster Bill Taylor, a 17-year industry veteran who was making beer in Montana at Neptune’s Brewery, joined them a few months later. Despite plans to open in the summer of 2013, construction and sewer issues, regulatory hurdles and the like pushed the date into the fall and then early winter. “We had a few hiccups,” said Agardy. Millions of dollars and months later, the brewery began producing beer shortly before Thanksgiving. Saltwater’s founders hope to produce 7,500 barrels in their first year of operating their 20-bbl system. Inside the brewery, Dustin Jeffers at work. A gleaming pinewood bar, fashioned from wood salvaged from the original building, dominates Saltwater’s taproom. Behind the glassed-in bar is the brewery, a collection of stainless steel including brew kettle and mash tun, six 40-gal. fermenters, two 20-gal. fermenters and two 10-bbl tanks. The fermenters are outfitted with glycol jackets to help tame the Florida heat. Grain, too, is stored in a temperature-controlled room. And the water is carbon-filtered to rid it of its heavy mineral taste. Saltwater Brewery is the latest arrival on expanding craft beer scene in South Florida, where eleven breweries and brewpubs have opened in recent years, from Miami to Tequesta. They include Due South Brewing, in Boynton Beach; Tequesta Brewing in Tequestra, just north of Palm Beach; Funky Buddha in Oakland; The Mack House – Holy Mackerel Nano Brewery in Davie; Wynwood Brewing Co. in Miami and such brew pubs as Titanic in Miami; Brewzzi’s in Boca Raton and West Palm Beach; Tampa Bay Brewing’s Tap House and Big Beer Brewing, both in Coral Springs; and The Funky Buddha Lounge in Boca Raton. And more are planned. “There’s a huge South Florida beer culture,” co-founder Peter Agardy, told me during my visit. “We saw an opportunity.” He explained that breweries, such as Saltwater are benefiting from the growing number of youthful craft drinkers in the area and a rising tide of first-generation craft beer lovers who have retired to the region. South End Session Ale, a low ABV session pale ale with a honeyed nose named for the area of Delray Beach where fishing and surfing are popular. Bonafide Blonde, a golden brew fermented with Belgian yeast. (Not tasted). Big Treble Amber Ale, a nicely balanced red ale. Screaming Reels IPA, whose name pays homage to deep-sea fishermen. It most definitely screams hops. SeaCow Milk Stout, named after the native Florida Sea Cow, the Manatee, who reside in the murky brackish waters of Florida. This light-bodied beer is dark, chocolately and roasty with a touch of sweetness. Flying Scotsmen Scotch Ale (not tasted).